Partners from Latvia and Lithuania will work together in the project to ensure sustainability and availability of manor parks for present and future generations. 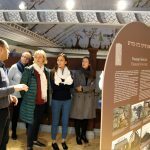 The project will support development of diverse, attractive cross-border tourism offer and promote preservation of cultural heritage on both sides of the border. The overall objective is to promote sustainability of cultural heritage sites and to increase their attractiveness for visitors. 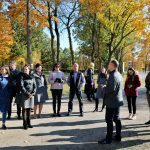 Project activities include improvement of 4 manor parks in Eleja, Koknese, Rokiskis and Pakruojis, the development of 3 new tourist routes, trainings for 100 tourism professionals and 50 park maintainers, experience exchange visits to partners` territories and visits of foreign journalists. Each partner will organize promotional event, like Orientation night and Kaleda festival, aimed at involving a wider audience. To promote renewed parks, partners will participate in 2 tourism fairs – Balttour (in Rīga) and Vivatour (in Vilnius). As a result of the project, parks` infrastructure will be improved, common products for visitors will be offered and knowledge of tourism professionals and park maintainers will be improved. 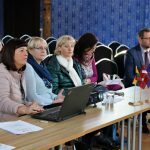 Cross-border tourism offer will be promoted in Zemgale region in Latvia, and Panevežio and Siauliai regions in Lithuania. 2nd Project Monitoring Committee and Project Implementation Group took place in Pakruojis on 9th October, 2018. 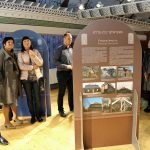 All partners gather in the renovated premises of Pakruojis Sinagogue and reported their achievements in the 1st reporting period and discussed information about activities in the next periods. In the end of the meeting partners visited Pakruojis Manor park, where project activities will take place.